Hamster behavior can vary depending on their environment, genetics, and interaction with people. Because they are easy to breed in captivity, hamsters are often used as lab animalsin more economically developed countries. Hamsters have also become established as popular small house pets. Hamsters are sometimes accepted even in areas where other rodents are disliked, and their stereotypically solitary nature can reduce the risk of excessive litters developing in households. * Hamsters are color blind. * Hamsters can only see up to six inches in front of them. *Hamsters typically have poor eyesight and depth perception. *To compensate for their poor sight when in unfamiliar territory, hamsters have scent glands on their flanks (and abdomens in Chinese and dwarf hamsters). A hamster rubs these areas of his body against various objects, and leaves a trail of smells the hamster can follow to return to his home den. 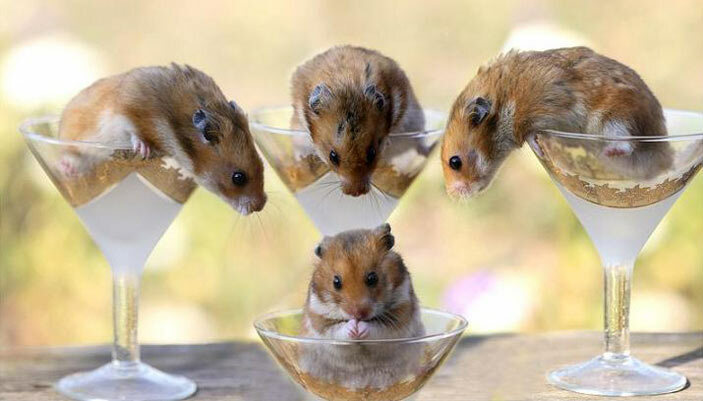 * Of about 14 distinct species of hamsters, eight are kept as pets. *During winter hibernation, the golden hamster's pulse rate drops from about 400 to 4 beats per minute. *Hamsters are nocturnal meaning they sleep during the day and are active during the night. *Though classified as nocturnal, most hamsters divide their days with periods of sleeping and waking. *Food: mainly seeds, grasses, root vegetables, fruits, corn and pulse crops. Common hamster also eats insects, lizards, frogs and small mammals. *Largest: about 34 cm (13 in) long, weighing about 900 g (32 oz). Smallest: about 5.3 cm (2 in) long, weighing about 100 g (3.5 oz). *In the wild, hamsters will line their tunnels with grasses and wool or hair shed from other animals to help maintain a fairly constant temperature in their burrow (often around 60°F), no matter the outside temperature. *In the cool of the evening and during the night hamsters will search for food - and can travel up to 8 miles in one night. The body fur of hamsters comes in a wide variety of colors, depending on the nature of the species. * Hamsters can remember their relatives. *Hamsters can be taught how to come by name. * Like other rodents, a hamster's teeth grow continuously throughout their lifetime. To help keep their teeth worn and clean, offer suitable chew toys on a regular basis. *Does your hamster avoid his chew sticks and chew on his cage bars? Then try giving him dog biscuits. They're hard, tasty, and wear down his teeth. He will want to chew on the biscuit rather than the cage. * If your hamster's toe nails are getting long, it is possible to clip their nails at home. Use baby nail clippers and clip off the very ends of the nails. *Don't clip too short! Or, try lining the hamster's running wheel with fine grain sandpaper, and the ends of his nails will be worn down while he runs. * The gestation period of a Syrian hamster is about 16 days. * Hamsters are most receptive to playtime during night hours. * Do not put all of a hamster's toys into its cage at once. Your hamster needs as much room to move in its cage as you can provide. * Always supervise your hamster while in a hamster ball. Do not leave your hamster in the hamster ball for more than 15 minutes; doing so could lead to dehydration or accidents. * Pay attention to your hamster's needs and desires. Don't try to force your hamster to play with you. * Play with your hamster only when other animals and pets are securely locked away from access to it.